Is Algae the Jet Fuel of the Future? For simple, tiny organisms, algae sure keep busy. In some parts of the world, furry clumps of algae are kept as pets. In other parts, the little plants are converted into biodegradable bottles or ink. In others, they wreak havoc, causing mysterious blood rains or intoxicating plankton. And in Germany's AlgaeTec lab, they may have a future as jet fuel. The development of the airplane was a turning point in Earth’s history for many reasons. Now that humans can fly, there’s no way we’re going to give it up. Yet a single 10-hour jet flight could use as much as 36,000 gallons of fuel. We’re burning through fossil fuels at a mind-boggling rate, but we can’t do that for much longer. So the race is on to find viable, sustainable alternatives. Biofuels from corn, flax, and other grains are less destructive options, but some scientists feel it’s unwise to turn food into fuel in a time of worldwide hunger. Additionally, farming those raw materials takes up a whole lot of space. Algae, on the other hand, can be grown in a jar. It grows 12 times faster than soil-rooted plants, and produces a tenfold yield per hectare of growing room. 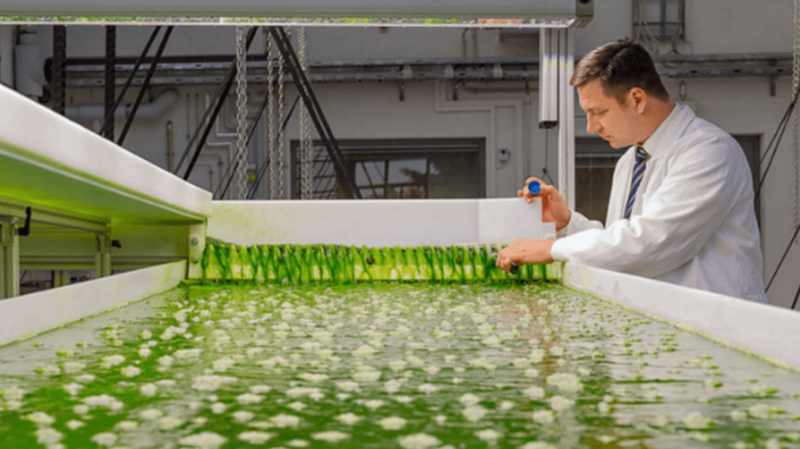 With 12 million euros in backing from the Bavarian government and jet manufacturer Airbus, the TUM team is hard at work puzzling out the most efficient ways to convert algae into kerosene.